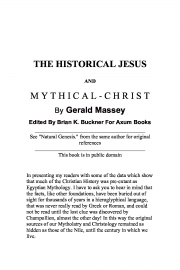 Description of "THE HISTORICAL JESUS AND MYTHICAL CHRIST (eBook)"
In presenting my readers with some of the data which show that much of the Christian History was pre-extant as Egyptian Mythology. I have to ask you to bear in mind that the facts, like other foundations, have been buried out of sight for thousands of years in a hieroglyphical language, that was never really read by Greek or Roman, and could not be read until the lost clue was discovered by Champollion, almost the other day! In this way the original sources of our Mytholatry and Christology remained as hidden as those of the Nile, until the century in which we live. The mystical matter enshrouded in this language was sacredly entrusted to the keeping of the buried dead, who have faithfully preserved it as their Book of Life, which was placed beneath their pillows, or clasped to their bosoms, in their coffins and their tombs. Gerald Massey (29 May 1828 – 29 October 1907) was an English poet and self-educated Egyptologist. He was born near Tring, Hertfordshire in England. Massey's first public appearance as a writer was in connection with a journal called the Spirit of Freedom, of which he became editor, and he was only twenty-two when he published his first volume of poems, Voices of Freedom and Lyrics of Love (1850). These he followed in rapid succession with The Ballad of Babe Christabel (1854), War Waits (1855), Havelock's March (1860), and A Tale of Eternity (1869). In 1889, Massey collected the best of the contents of these volumes, with additions, into a two-volume edition of his poems called My Lyrical Life. He also published works dealing with Spiritualism, the study of Shakespeare's sonnets (1872 and 1890), and theological speculation. It is generally understood that he was the original of George Eliot's Felix Holt. In regard to Egyptology, Massey first published The Book of the Beginnings, followed by The Natural Genesis. His most prolific work is Ancient Egypt: The Light of the World, published shortly before his death. His work, which draws comparisons between the Judeo-Christian religion and the Egyptian religion, is not considered significant in the field of modern Egyptology and is not mentioned in the Oxford Encyclopedia of Ancient Egypt or similar reference works of modern Egyptology. Reviews of "THE HISTORICAL JESUS AND MYTHICAL CHRIST (eBook)"